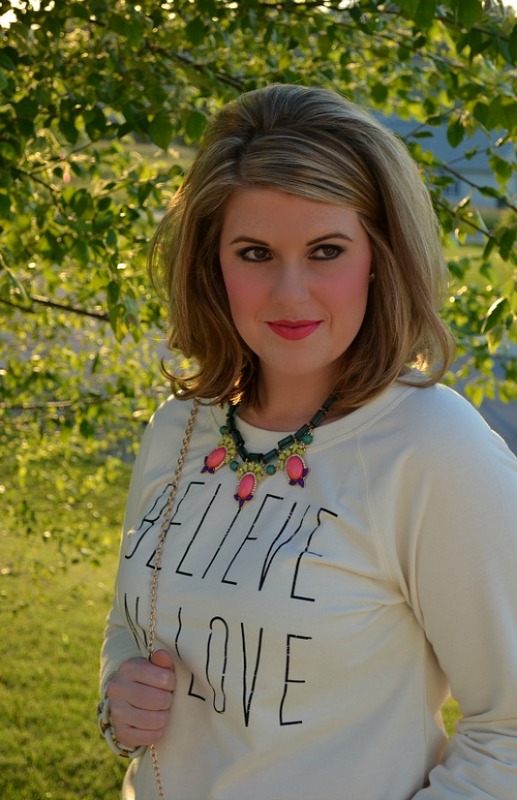 As evidenced from lots of recent instagrams (here, here, and here), I love coral. It's a great alternative color for summer and surprisingly pairs well with lots of other colors. I especially love the way it looks with gold - like this fun crossbody bag from Vieta (more on the bag in a minute). 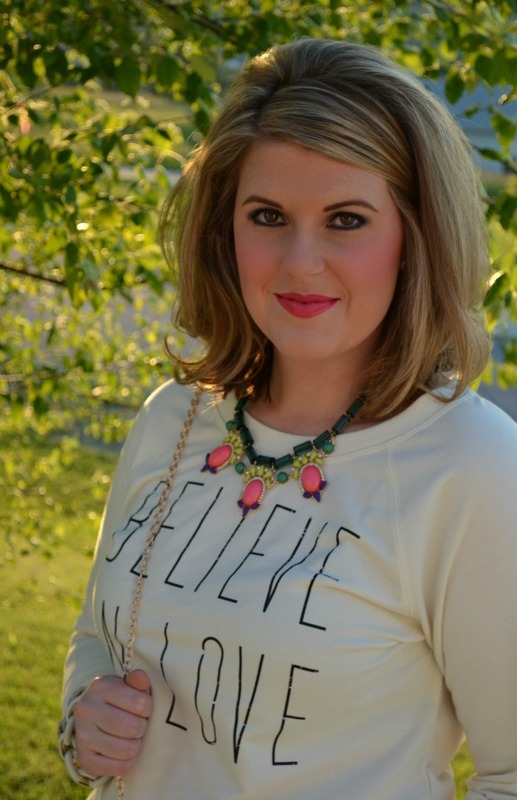 First, I want to chat about this fun necklace. I've been lusting over had my eye on this necklace for a while, so when Max & Chloe offered to send over a piece to feature on my blog, I knew this had to be it. 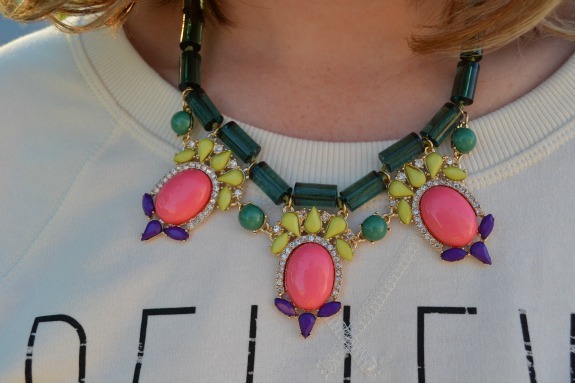 I love the unexpected color combination and sparkle of this piece! You can shop all the fashion jewelry from Max & Chloe on their website - SO much to drool over! Now, let's discuss the bag. I love a strong staple piece. 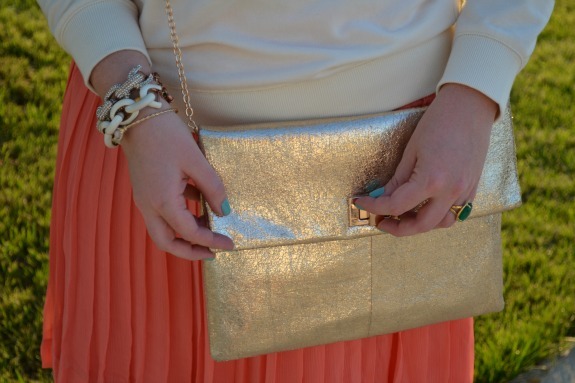 And for me, the wear of the gold pieces in my closet is always maximized - gold shoes, gold jewelry, and gold bags. I was instantly smitten with this clutch/crossbody the second I saw it. It's big, has a generous length chain, and can hold more than the average clutch - and very affordable. If you aren't familiar with Vieta, click over and browse their site. They have a great selection of unique styles (like this leopard crossbody) and colors (like this classic satchel). I'm partnering with Vieta for a great giveaway for you all today. Winner's choice! Yep, if you win you get to pick the bag - any bag! Just follow the steps below to enter! I love a fun give-away! I'd choose the Gracie. I also love the combination of the graphic tee with the pleated skirt. Unexpected and super cute! Can't wait to see you on Thursday! I love your necklace...and your bag! I think I'd pick a clutch if I won; so many fun choices! Love the Gene bag!!! Great giveaway! The Tulara is my favorite. I love that coral skirt and necklace. Beautiful! I am in love with this sweater!! I will be ordering this for sure!! 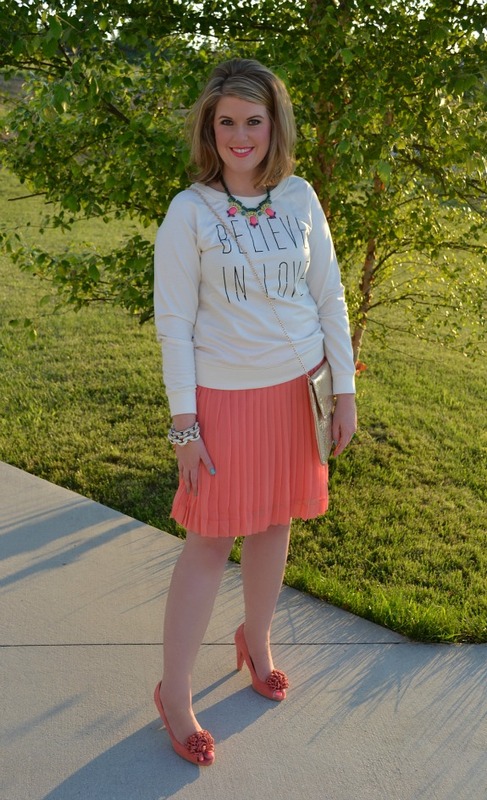 I love coral for summer, and this pleated skirt is perfect. So pretty! I love the Edona! Thank you for a great giveaway!! They are all so cute! But I would choose Rani! I would choose the LUCIA. I like the color block look to it! What a fun giveaway! 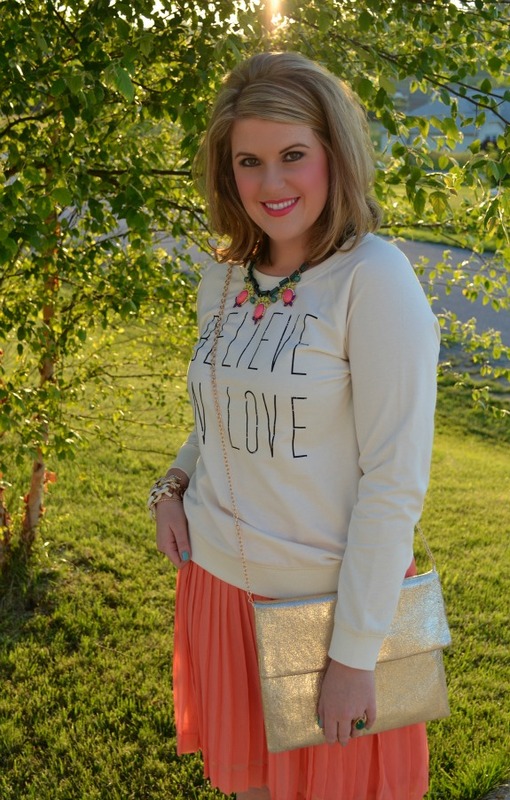 Coral is a great color and I LOVE that gold envelope bag!! What a great giveaway. I would pick the Rommy Tote! Love the BISERO shoulder bag! I like the EVA bag in pink. You look beautiful! I love the coral shoes/skirt! Perfect! Coral + Gold?! *_* Such a perfect combo. Congrats on getting that necklace. It's gorgeous. And what a great giveaway! Thanks so much for hosting it. I love your outfit! You look so pretty. I would choose the Salias since I need a new tote bag. If I won I think I'd choose the Lioba clutch! i love the laurie bag . What an awesome giveaway to host! Thanks for introducing me to yet another neat place to shop! Vistas bags all seem ardorbzz! I would love to try the Tulara. As always, you look delightfully charming! Best regards! I really like the Onida in Blue, striking. Gale clutch bag is gorgeous! I really like the Aggie bag. I've been jonesing for a mustard handbag for ages. I love the Benni Hobo in yellow! What a fun giveaway! I like the Jazmin in Mint! I love the Aggie in Pink. Thank you for a wonderful giveaway! i like opal in black!! I love the Onida Bag in beige! The clutch you've got is so pretty, but their collection is pretty awesome so i'd go for the Heidi or Haben clutch. Entered rafflecopter as Shake M.
I like the odetta bag !